Coming 30 years after Dream Police Cheap Trick's The Latest is quite possibly their best work since that 70's masterpiece. Rick Nielsen has remarked that Cheap Trick has 'grown up without growing old,' and he's right on. The Latest is not a cheap warmed over trick of former glories from this band who knows how to craft grand hook-laden melodic rock. If anything it appears that Cheap Trick wants to remind you of their long standing influences as the draw deep from the well of the melodic rock which influenced them 30 years ago. The Beatlesque motif is heavy on The Latest particularly on Miss Tomorrow, Everybody Knows and many others. If there is such a thing as pop-a-billy, the infectious and deliberate rocker, California Girl extends their musical reach into the those seminal years of the 1950's. In the end, however, The Latest is pure Cheap Trick in their finest form. This disc is filled with sweeping string arrangements that make the compositions both slick and thick as on Everybody Knows. Never shy from warming us with sweet ballads, The Latest contains some wonders with These Days, the wonderful Smile, and the light lullaby Sleep Forever (which starts the album!). Guitar guru and collector Nielsen also proves that you need not be an axe slinger to be creative and provocative as his eclectic and versatile work on Alive, Time Of Our Lives and Closer certainly prove. 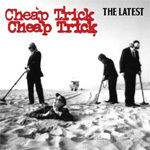 Cheap Trick's The Latest is another lush and entertaining statement for this band's established place as a great American rock and roll band. They have never sounded better or more relevant. Very recommended. Cheap Trick's The Latest is another lush and entertaining statement for this band's established place as a great American rock and roll band. They have never sounded better or more relevant.